Blooming flowers, cool and refreshing breezes, the sound of rain tapping against your bedroom window — spring is more than just another season. It’s a reminder that no matter how deep the snow, it’s never enough to stop the arrival of warmer weather. Bare branches will sprout green leaves. The grass will come in full and thick, dotted with water from the previous night’s rainfall. A new, green world will emerge from the once-frozen ground and it will be rich with color and possibility. Winter will always end with the resurgence of new life — it’ll always end with spring. When I was younger, spring used to signify the beginning of another break from school, a chance to spend the evening chasing butterflies and soaking up the sun. From those days, I still remember the cool, prickly feeling of the grass tickling my ankles while I rested in the backyard after a long bike ride. But more than that, spring is a reminder that it’s never too late to start over. It’s never too late to make a fresh start, whether that’s moving across the country or simply organizing your yarn stash. 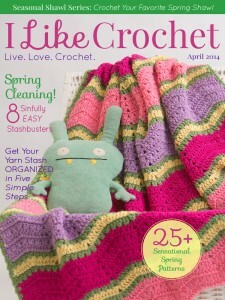 Keeping those things in mind, this special spring edition of I Like Crochet features fresh and colorful patterns that will inspire you, challenge you, and nurture your growing passion for the art of crochet. No matter what your skill level, you’ll discover just the right project for your next spring adventure inside I Like Crochet.